Who's laughing now? It's you! Why? Because you're settling back with a rib-tickling collection of Great Radio Comedy! All of your favorites are here: Jack and Fred, Phil and Alice, Fibber and Molly, Edgar and Charlie, George and Gracie, Lum and Abner, Snooks and Daddy, and many more! Crack a smile as the kings and queens of comedy crack wise. 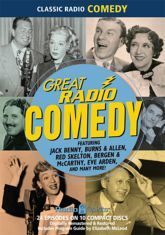 Here are twenty digitally restored and remastered episodes of radio revelry from shows that have kept Americans in stitches for more than 50 years. Includes rare episodes, and a Program Guide by Elizabeth McLeod.